Submiting a painting to critical analysis is a difficult a task. The dissertation of the compositive forms (i.e. the structural elements) and the colours applications cannot be done ad arbitrium, but follows the “principle of visual observation”, in others words, explaining what the eyes do see and perceive (i.e. the visual rendering); it is in any case worth stressing that, to see with the eyes, does not mean “to see beyond the image” and to know or to have “the principles of knowledge and of historical understanding”. This discrepancy is certainly very great, and in the past – XIXth and XXth centuries – it has neither permitted a balanced and accurate interpretation nor a critical judgment about Gros’ painting “Le général Bonaparte au pont d’ Arcole”. We share the opinion that these interactive factors, both coupled in the right way and comprehension, have never been taken with due consideration, especially referring to the absolute lack of military history exactitude relating to Bonaparte’s daring along the right warping-bank of the Alpone (15th November 1796). The thesis I propose is centered on the following three-part cultural specification. I. To see and comment on Gros’ painting by merely relying on the “principle of visual observation”, is a misunderstanding to be deprecated, when not a failure being deprived of the historical background (the circumstanced strategic deadlock that unexpectedly faced the Republican demi-brigades engaged on the right wing of the Armée d’ Italie at the clash of Arcole). II. This incohesive process of definition, that we call “cultural elision”, is absolutely limited and unsuitable: it neither means to know nor to properly understand the chromatic efforts (i.e. the final outcome of the picture) and the depicted battle-scene in the sphere and in the true line of historical events. III. a) It is a point of importance to preserve the autonomous dignity of history as it really did happen in the past centuries; b) to re-establish the proper and honest order of historical events distorted by any post-revolutionary embellishments; c) to re-comprehend and re-value the true inner significance of this painting by properly written studies; d) to provide cultural advice to the museums where Gros’ original artistic studies are being kept carefully exposed to postmodern generations. The fruits of extensive researching, pursuing the much rewarding elegance of the truth, will certainly be appreciated. Antoine-Jean Gros (1771- June 25, 1835) was the son of Jean-Antoine Gros. His birth in Paris came from the second marriage of his father Jean-Antoine with Madeleine-Cécile Durand. A naturally gifted young boy, his inclinations towards drawing were remarkable. Since an early age he was brought up within an artistic milieu, receiving then the artistic cares of Madame Vigée-Lebrun. At the same time, his parents, actively employed with the fine arts (they were miniaturistes), provided him a useful source of support and favourable creative inspirations. In 1785, the fourteen-year-old Antoine-Jean entered the famous atelier of Jacques-Louis David (1748-1825), and he frequented it assiduously; at the same time, he continued to follow the classes of the Collège Mazarin. A couple of years later, he attended the école de l’ Académie de peinture working on living-models. His paintings “Baigneuse près d’ un ruisseau” and “les Berges d’ Arcadie” date to the year 1791, and are preserved in the Musée de Besançon. The death of his father – whose circumstances had been altered and embarrassed by the Revolution – was to have a major impact on his life. In 1791, Gros was thrown upon his own resources. Due to his inborn talents, Gros entered the Prize of Rome (1792) with a work entitled “Éléazar préfère la mort au crime de manger un mets impur”. Disaffected and disgusted by the July 14th Revolutionary outbreak (1789), by the social excesses and political extremisms that led to the execution of the king (1793) and to the fall of the centuries-old monarchical institution of Divine Right, the young artist received a passport to Italy thanks to the intervention of the neo-classical master-painter David. On 31 January 1793, he succeeded leaving the capital of France, Paris, whose soil had been ignominiously sprinkled by the blood shedding of the Bourbon monarch Louis XVI (1754-1793). Along his travel, he passed through wonderful locations, notably the towns of Nîmes, Montpellier, Genua, and Florence. It was there that he finally stopped to proffer his services and to draw for the Galleria degli Uffizi. In 1795, Gros came back to the Riviera Ligure, and reached the maritime town of Genoa. His personal adherences and protections were influential: among his connections there appeared a wealthy Swiss banker, monsieur Meuricoffre, and monsieur Lachèze, then appointed consul of France. Last but not least, was the outstanding figure of the Plenipotentiary Minister of France by the Repubblica Genovese, Guillaume Charles Faipoult de Maisoncelles (born in 1752). His wife had kept a benevolent eye on the promising young artist, and thanks to her well-disposed kindness Gros was amiably intoduced (1796) to Joséphine de Beauharnais, now sweetheart of General Bonaparte, commander-in-chief of the Armée d’ Italie. “Elle me reçut de la manière la plus honnête, et commença d’ elle-même à me dire qu’ elle savait que mon désir était de me rendre à Milan et d’ y prendre divers renseignements pour composer quelque-unes des victoires de son mari”. The political connection Faipoult-Joséphine, whose terminal was apparently the painter Gros, had instead a peculiar denotative character; it properly developped a new project, a line prone to exalting the martial glories of the unconquerable generalissimo of the Armée d’ Italie while confronting the armies of the Danubian monarchy in the first Italian campaign (1796-1797). “Joséphine était comme un ange tutélaire auprès de Gros; elle ne lassait échapper aucune occasion de le servir et de l’ encourager. Il faisait partie de la famille Bonaparte, à la casa Serbelloni. Gros’ portrait of General Bonaparte marching afoot along the Alpone Stream represents an artistic reproduction with undeniable romantic features; its ispiring source was taken from the military engagement which occurred in the marshes of Arcole (15-17 November 1796). Its expressive tonalities represent the result of the struggle that took place along the right warping-bank of the Alpone stream, in the boggy environment of a village under the jurisdictional authority of the Stato Veneto. Apart from the beautifully accomplished stylistic execution, the painting is not meaningful to the viewer without taking into account the military operations which were carried out on the right wing of the Armée d’ Italie. This image, however, is conditioned by some factors. The pictorial work is vitiated by the propagandistic character of military intrigue pursued at the end of the 18th century, a chain of subtle implications involving some prominent personalities of the time (the farsighted General Bonaparte, his caring wife Josephine, and the ingenuous artistic executor, the painter Gros). 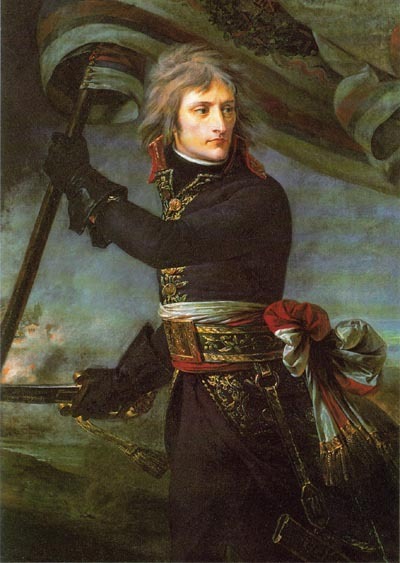 Substantially, the painting is equally conditioned by the character of the historical incomprehensibility: the military traits of Bonaparte’s daring remained unknown, and not researched through coeval historical narratives. The pictorial elements giving compositive breath to the structure of this self glorification and individual act of magnitude show some major deficiencies. It would be worth recalling that a proper understanding of this image is unintelligible due the lack of details concerning the engagement against the Habsburgic troops; therefore, evaluation of the image cannot be understood for the lacking of adequate historical background. The painting that would have had to mark the brightest memory of the three-day stunning confrontation at the bridgehead at Arcole, is paradoxically transformed in a celebration of the cult of personality of the Général en Chef of the French-Republican army in Northern Italy. Beyond any reflection concerning the finely executed chromatic efforts and compositive applications of Gros’ painting, this contraditory factor has never been cached nor put in evidence. Such a war-like visualization had its discrepancies: its artistic production had itself affirmed to the disadvantage of the combatants (the battle took an exacerbating toll from the French divisional forces; the fighting revealed all the strategic inadequacies of the martial confrontation, and, most especially, the difficulty of manoeuver in the marshy extensions of the Low Adige area) of the Armée d’ Italie which were engaged against the Imperial battalions. Recapitulatory concepts: the image reproducing Bonaparte marching forward to the bridgehead which the Croatian infantry units had established in the village of Arcole, is as much as of most complex gave birth the strategies of post-revolutionay republican behaviourism; at the same time, they were not excluded idealistic projections which had left the probity of human ethics to hand down to posterity – via Josephine – the individual affirmation of a victorious military autocrat. This point is important; when the cornucopia of the Armée d’ Italie was filled with an astonishing string of victories gained over the armies of the first Allied coalition, Napoleon’s inner ego faced its hardest confrontation with the stormy winds of vainglory and adulation. These restrictions represented the points of the conflicting personality of the French generalissimo which have never been spoken about; so far, they have been disregarded. Josephine’s idea, and the whole artistic planning, although quite an expression of spontaneousness for their sober linearity, took its source from ambitious reasons which were to make of the artistic mediation the differential factor, the absolute quid along the lines celebrating the clash at Arcole. Bonaparte’s individual daring, which paradoxically proved a severely tested character of vulnerability to the French generalissimo and his General-Staff while standing under a hail of bullets at the bridgehead of Arcole, remained unaccounted for. The images reproducing Antoine-Jean Gros masterpieces are beautifully exposed in some major cultural institutions of continental Europe. These places are usually referred to and called Museums. The first place we want to recall is in metropolitan France. Located in the capital, the wonderful city of Paris, visitors can visit the world famous Musée du Louvre. In the section “Peinture française”, appears a painting entitled “Bonaparte au pont d’ Arcole, le 17 novembre 1796”. Date of composition is the year 1796; the executor’s name is Antoine-Jean Gros. This a work is a peinture à l’ huile sur toile (an oil on canvas); dimensions are H. 73 cm. x W. 59 cm.. Acquisition of this artistic production came to the Museum through a gift presented in 1883 by Madame Milliet (born Schubert). Precise location where it has been exhibited at the Musée du Louvre, is the Aile Sully; Deuxième étage, Section 54. Some necessary observations must be expressed about the picture’s title. General Bonaparte’s determination never materialized at the bridge of Arcole on 17 November 1796; his daring act happened on 15 November 1796, the first day of struggle against the Imperial army. A rectification must be done to preserve the dignity of history (especially the first Italian campaign of 1796-1797) and the military actions which developed in the marshy grounds at Arcole. Furthermore, the Général en Chef of the Armée d’ Italie never reached the bridge over the Alpone Stream; he was prevented crossing it by the murderous fire which the Croatian infantry units enfiladed at point-blank range on the desultorily approaching French-Republican storm-parties. At the disputed bridgehead at Arcole, the blue-clad combatants incurred severe loss in strength and morale; the offensive movement invigorated by Bonaparte’s resolution, unexpectedly turned into a bloody massacre where nothing glorious happened for the honour of the French arms. “The battle of Arcole (November 15-17, 1796) was a key event in the first Italian campaign and marked the start of Napoleon Bonaparte’s meteoritic rise. At the beginning of the clash, Bonaparte seized a flag and attempted to cross the bridge separating the two armies, but he was driven back by Austrian fire. Victory only came two days later. Back in Milan, Bonaparte commissioned this painting from Baron Antoine-Jean Gros, a student of David, to serve as propaganda for himself”. The linearity of these lines is quite delightful. Appreciation must be given to the first phrase. Not only is it recalled that the French-Republican forces were involved in the first Italian campaign in Italy (a much needed presentation permitting anyone having an interest to probe deeper in the matter), but the military comment that the battle of Arcole was a key event appears striking. At any rate, there are a couple of rectifications to be explained: Bonaparte never seized a standard at the beginning of the clash. The date of the episode is remarkably exact: 15 November 1796. Furthermore, at the time Gros was commissioned for the painting, he had not yet been invested with the aristocratic title of Baron. The baronage was bestowed on him later, and not during the troublesome years of war 1796-1797. With the last phrase, the brightest honesty of research does appear: the ordered painting had the subtle finalities to be used as propaganda to a man and to his ever increasing ambition. Lavalette, Antoine Marie Chamans. Memoirs of Count Lavalette. London: 1831. Chesneau, Ernest Alfred. Le peinture française au XIXe siècle. Paris, Didier, 1862. Clausewitz, von, Carl. La Campagne de 1796 en Italie. Paris, L. Baudoin, 1899. Delécluze, Etienne Jean. Louis David: son école et son temps: souvenirs. Paris, Didier, 1855. Delestre, Jean Baptiste. Gros et ses ouvrages; ou mémoires historiques sur la vie et les travaux de ce célèbre artiste. Paris, J. Labitte, 1845. Delestre, Jean Baptiste. Gros, sa vie et ses ouvrages. Paris, 1867. Les artistes toulousains et l’ art à Toulouse au XIX siècle. Librairie-Marqueste, 1924. Revue historique. Librairie G. Bailleère, 1876. Echérac, Arthur Auguste Mallebay du Cluseau. Le baron Gros. Paris, Librairie de l’Art, 1887. Lemonnier, Henry. Gros, par Henry Lemonnier...biographie critique, illustrée de vingt-quatre reproductions hors texte. Paris, H. Laurens, 1928. The “art” of war: explanation of a word. The comprehension of a painting is certainly not easy a matter. By the word painting, we mean the pictorial representation and its thorough stylistic execution. The pictorial representation implies the using of colours, of the light intersections, of the shadings. The representation of the thematic subject is primarly important. The painting implies the human subject that “gives life to the portraying vivification” and paints it with due efforts: the painter, the talented person that lends his art and his artistic capabilities to the customer, being him a private person or else. The final result of brushes and colours is therefore called and aptly conjugated in the word painting. The painting reproducing General Bonaparte boldly marching forward to the enemy tête de pont at Arcole, during the first Italian campaign of 1796, represents the remarkable object of a private commissioning. And the commitment of the oil picture of General Bonaparte, standing alone and bareheaded in the mist of confusion and turmoil, had been entrusted to a disillusioned observer (Antoine-Jean Gros) of the newly installed governmental institution of the French nation: the “Republican Hydra”, that is the Directoire. It would be worth recalling that such a depiction properly represents a flux of convergences and a moment of meeting in between the purchaser (A, first factor of determination), the artistic executor (B, second factor of determination), and the portrayed historical event (C, third factor of determination). Three specific factors are therefore laid down and related, but only the third one has its own autonomous dignity. Madame Élisabeth Vigée-Lebrun (1755-1842) was a French painter. She was influenced by Greuze, and became the official painter of the Queen Marie Antoinette. A painting, “Self portrait with daughter” is preserved at the Louvre. Vide: Blum, A., Madame Vigée-Lebrun peintre des grandes dames du XVIIIe siécle, H. Piazza, Edition d’Art, Paris, 1919; Bouchot, H., Une artiste française pendant l’ émigration: Madame Vigée-Lebrun, in “Revue de l’art ancien et moderne”, 1898, pp. 51-62, 219-230; Brun, Le, J. B. P., Précis Historique de la vie de la citoyenne Lebrun, peintre: par le citoyen J.B.P. Lebrun, Paris, s. d. ; Hautecoeur, L., Madame Vigée-Lebrun; étude critique, Paris, Librairie Renouard, 1917; Helm, W. H., Vigée-Lebrun 1755-1842: Her Life, Works and Friendships, with a catalogue raisonné of the artist’ s pictures, London, 1915; Lucas, E. V., Little Books on Great Masters, Chardin and Vigée-Lebrun with a frontispiece in colour and twelve other illustrations, G. H. Doran Company, New York and Methuen and Company, London, 1924; Macfall, H., Vigée Le Brun, Masterpieces in Colour, Illustrated with eight painting reproductions, Frederick A. Stokes, New York and T. C. & E. C. Jack, Ltd., London, 1922; Madame Vigée-Le Brun: Peintre de Reine Marie-Antoinette, Goupil and Cie, e Manzi, Joyant and Cie, Paris, 1912; Malamanni, V., Isabella Teotochi-Albrizzi, i suoi amici, il suo tempo, Locatelli, Torino, 1883; Mycielski, J., Wasylewski, S., Portrety Polskie Elsbiety Vigée-Lebrun, Lvov and Poznan, 1928; Muntz, E., Lettres de Mme Le Brun relatives à son portraits de la galerie des Ofices (1791), in “Nouvelles archives de l’art française”, 1874-75; Nolhac, De, P., Madame Vigée-Le Brun: Peintre de Reine Marie-Antoinette 1755-1842, catalogue raisonné de H. Pannier, Goupil and Company, Paris, 1908; Sainte-Beuve, Mlle, A propos de l’ émigration de Mme Vigée-Lebrun, in "Bulletin de la Société de l’Histoire de l’Art Français", 1934, p. 182; Pillett, C., Les Artistes célèbres: Madame Vigée-Lebrun, Librairie de L’Art, Paris, 1890; Tripier Le Franc, J., Notice sur la vie et les ouvrages de Madame Vigee-Lebrun, in “Journal Dictionnaire de Biographie”, 1828, pp. 177-192; Vigées Le Brun, E., Souvenirs de Madame Louise Elisabeth Vigée Le Brun, 3 vols., Librairie de H. Fournier, Paris, 1835; Vuaflart, A., La tombe de Madame Vigée-Lebrun a Louveciennes, in "Societé de l’histoire de Paris", 1915, pp. 3-15. The palazzo degli Uffizi, in Florence, was built in the XVI century by the architect Giorgio Vasari (1511-1574) by order of Cosimo I. Nowadays it houses the celebrated Art Gallery. Delestre, 1867; p. 35. A linguistic specification must follow; the word casa, is in this case extracted from the Italian language. General Bonaparte was instead comfortably lodged in the palazzo Serbelloni, actually located at 22 Corso Venezia, Milan. After the guillotining of the monarch Louis XVI of France (January 1793), it was steadily formed a military coalition which counted on the military capabilities of the major European Powers: the Austrian monarchy, the Austrian Netherlands, the Kingdom of Great Britain, the Kingdom of Naples, the Kingdom of Prussia, the Kingdom of Sardinia (whose troops were at war with France since 1792), the Kingdom of Spain. The First Coalition (1793-1797) relied on major concerted efforts (offensive plans, and preventive warfare) to contain the pernicious influences of social disorder (French Revolution) and the abatment of the constituted order whose pillars lied on the centuries old establishment of Divine right. In this case, sufficient it to mention that Bonaparte lodged as a grand seigneur with his court at a place north of Milan, whose name was Mombello. The location was then named villa Clerici. In this charming residential abode, a fortified mansion, he and his courtiers were housed in May and June 1797. The seeds of power, prefigurement and prelude to the conquest of the empire, were silently growing under the sparkling rays of the Italian sun, that is from the outstanding victories reported in the Northern plains of Italy against the armies of the Danubian monarchy. Worth mentioning this concept: it was from those days of fame and grandeur that Bonaparte started dividing his personality of military leader with that of a political autocrat. This coexistence of identities, would need further attention and dissertation. In August 1797, the ordonnateur en chef of the Armée d’ Italie, Simon-Antoine-François-Marie de Sucy, wrote: “Je ne lui connais pas de point d’ arrêt autre que le trône ou l’ échafaud” (transl. : “[...] there is no halting place for Bonaparte, he will either end on the throne or the scaffold”). That same year, in a September dated note, Louis-Alexandre de Launay, comte d’Antraigues, affirmed that: “If there were a king in France and he not that king, he would wish to have raised him to the throne and mantained him there at the point of his sword, which he would never lay aside so that he might thrust it into his Sovereign’s heart the moment he ceased to do his bidding”.